In the spring of 2008 a discovery was made. At the bottom of an overgrown garden of a terraced house in Aberdeen was a large corrugated iron shed, a shed that had not been opened for over thirty years. This shed once served as the studio to the painter, sculptor and designer Frederick William George. Once the door was opened and the cobwebs cleared away, the dim light revealed the world of Frederick George much as he had left it, thirty-seven years before. The artist's cloak still hung on a peg on the back of the door, his brushes and paint, now cracked and dry with age sat on the bench, his easel with an unfinished canvas waiting to be completed sat in front of rows of sculptures and boxes filled with canvasses and sketches. Since his death in 1971, his studio was sealed as a shrine to the man, none of his work was sold, left exactly as he had left it. Dusty sheets covered the contents of many years of work, protecting this time capsule that represented works spanning the artist's career. The discovery was made after the recent death of George's companion, as agents prepared to value and sell the property in Aberdeen. stock, but his father chose to pursue a career in the railways, joining as a foreman wagonwright. As a sideline George's father John and his mother Elizabeth Morrison ran a cottage industry producing bagpipes. She would sew the tartan bags whilst John turned the drones, chanter and mouthpiece out of ebony. As a result Frederick learned the pipes alongside his education in the local school. When Frederick completed his schooling he decided that he wanted to take an apprenticeship as a monumental mason, as some of his forebears had done before him. On completion he joined Gray's School of Art for Modelling Life Drawing and Sculpture, Aberdeen. Despite his father's opposition to this development, Frederick proved an able and worthy student, winning certificates for excellence in each of the subjects taken followed by prizes for modelling in a competition on the subject of `Poverty', offered by Lord Innes of Learney, and another for his sculpture of King Edward VII in coronation robes. As war was declared in 1914, George, who was in the Yeomanry, was called up and sent to Mesopotamia as a gunner in the Royal Artillery. He was not an official war artist however he used his time overseas to continue to sketch. He was billeted in Sammara, near Baghdad and his sketches in watercolour and pastel of the blue and gold domes of the city were later to be used in full-scale canvasses on his return to Scotland. As peace broke, George like many others of his generation who survived, found it difficult to settle down at home and get a job. There was little out there and the artistic training of which his father had been so resentful, did not help. Eventually he was to find employment for a firm making fish boxes in Torry, however his dream of being an artist and sculptor never waned. It seems apt that George's artistic career was rekindled as the demand for commemorative memorials to the war increased. He was commissioned for several War Memorials mostly in the North East of Scotland including the one in Inverurie, to the west of Aberdeen. These in turn led to other sculptural commissions including the work of modelling the capitals for the pillars for the National Commercial Bank of Scotland and modelling the heraldic work at the House of Schivas for the then Governor of the Bank of England. As well as public commissions George continued to paint draw and sculpt on his own behalf, exhibiting his work at The Royal Scottish Academy in Edinburgh and various exhibitions in Aberdeen. Inevitably George was to turn to teaching and in 193 S he was offered the post of teacher of sculpture and life drawing at Gray's School of Art, where he himself had been a student. The post, which he much enjoyed was short lived as his students were called up in turn to serve their country in the Second world war. As numbers dwindled it was decided to close the school. George was sent to then teach younger pupils at the grammar school and later on at Torry Grammar School where he became involved in the amateur dramatics, painting the theatre sets and scenery. George continued to sculpt, specialising in his depictions of children, he was also an avid sketcher and painter. He is perhaps best know for his monument to Scott skinner, `the Strathspey King' one of Scotland's most popular composers. The Scottish soprano Violet Davidson launched an appeal for funds to erect a monument to Skinner and George was commissioned to model the bust of the composer and decorate the lower section of the stone showing a violin and a scroll of music, the music being `the Bonnie Lass of Bon-Accord' which was one of Skinner's signature tunes. Contributions towards the memorial came from far and wide, including the Prime Minister J. Ramsay Macdonald. The Monument was unveiled at Allenvale by Sir Harry Lauder in 1931. After George retired from teaching, old age began to take it's toll, his eyesight began to fail and his artistic output suffered. He spent time at his country house in Cookney as his daughter describes `back, to his roots tilling the ground and growing vegetables and a variety of potatoes ... sometimes he played the bagpipes and those within hearing distance called him the Lone Piper'. 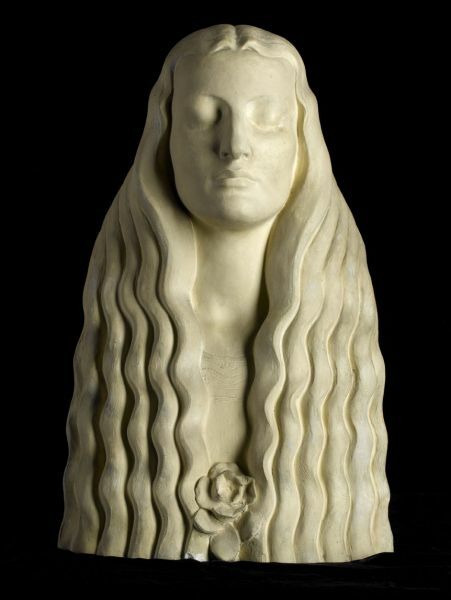 Frederick William George is somewhat of an enigma, his work today is virtually unknown although people pass his monuments and sculptures in Scotland every day. He is very much a forgotten figure in the world of art, explained in part by the disappearance of his life's work after his death in 1971. Thirty-eight years after his death we hope that the rediscovery of these works will bring Frederick William George the recognition that he so justly deserves.